There are lazy days, and then there are busy days. A lazy day might be rainy or gloomy, with a bit of chill in the air - a perfect day to snuggle in a favorite chair with a quilt, a book, and a mug of tea. A busy day takes me out of the house for hour after hour, working, running errands or involved with some important project. This is the perfect supper for either day. In fact, I like to cook as much of this as my oven will hold, because the uses of the leftovers are so fabulous. Looks simple, right? Oh, it is. Heat your oven to 250˚ F. That's not a typo: two hundred fifty degrees. Get as many chuck roasts as you like. Put them in one, or more, baking dishes or low roasting pans, so that they fit snugly, all in one layer. If you have a lot of roasts, use multiple pans. I find that two average chuck roasts fit well in a 9x13 Pyrex baking dish. Sprinkle generously with salt and pepper. Cover the pans with foil (no, it doesn't matter whether shiny side is in or out) and stick 'em in the oven. Bake, blissfully unattended, for about 5 hours. 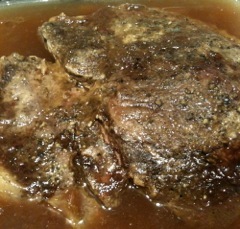 At the end of the cooking time, the beef will be thoroughly browned on top, and will be fork tender and ready to fall apart. Carefully remove the beef to a carving board, and let it rest, covered with foil while you deal with the liquid. Pour off all the liquid - there will be a surprising amount! - into a fat separator, and let stand 10 minutes or so. At this point you can pour off the fat, and use the liquid to make gravy (if you like). If you're cooking ahead, you can just pour all of it into a storage vessel, refrigerate it, and lift off the solidified fat from the top the next day. Chunked, in beef vegetable soup (with or without barley) - use the de-fatted liquid in here! Amazingly good.